What Is a Tree Support System | Florida Wire & Rigging Supply, Inc.
Give us a call today at 800-846-0309. Trees can be a beautiful addition to your yard if cared for properly, or a huge hassle if you don’t do things the right way. For example, some trees need a support system to keep them standing tall. Read on to learn more about tree support systems and what they do. While most trees have a sort of ideal shape, each individual specimen is unpredictable. Trees grow differently based on how they’re positioned in relation to the sun, what other plants and trees are around them, and what sort of obstacles they have to grow around and above. Because of this, it’s important to give your trees a little bit of help in growing the right way—often referred to as “training” a tree. If you don’t take care of these problems at their root—no pun intended—there’s a good chance you’ll end up with a tree that’s structurally weak in some way. If that’s the case, a tree support system can help hold things up to prevent injuries and property damage from falling branches or trees. 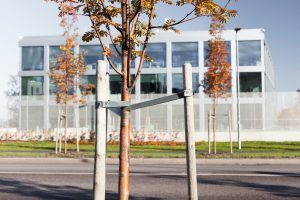 Tree support systems can work in various ways, supporting whole trees, single branches and more. They work through a system of cables and braces that keeps the branches of a tree from moving around too much since that’s when branches usually snap. Each support system is uniquely designed for the tree it supports because numerous different support problems can occur with a tree. Because of this, there are some types of support problems that can’t actually be fixed by a tree support system, in which case you’ll need to have a professional tree removal service safely remove the tree or dangerous branches. Dealing with structurally weak trees is dangerous work, which is why it’s best left to the pros. Florida Wire has the tree support system equipment you need to get the job done. To learn more about the products we carry, visit our website. © 2003 - 2019 Florida Wire & Rigging Supply, Inc. All rights reserved.